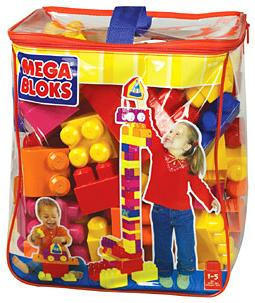 Size (inches): 5.91" X 5.91" X 11.81"
Big variety and bigger fun combine in this colorful assortment of blocks. Create your own visual effects with a spiral wheel block and other specially decorated blocks for an endless array of building possibilities as big as your imagination. Construction ideas are printed on the bag to help start the fun. 80 pieces that are great for little hands!